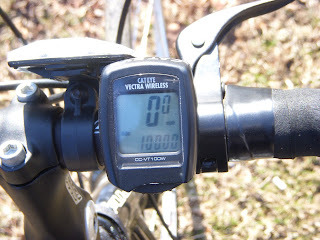 I met a 2008 Year end goal this past week by reaching 1,000 miles ridden on my Fuji Road Bike. I hit the 1,000 mark on Christmas Day, allowing myself a holiday gift of biking on what was a gloriously sunny and somewhat warm day (all of 40 plus degrees! But no wind!) Technically, I have ridden more than 1,000 miles on the new bike, but I did not have the odometer on the bike since day one, to give me the actual feedback. I'm sure between riding the cruiser about 20 miles a week on average and roughly 100 miles not calcuated I may have pumped over 1,300 miles since June! Yowsa! Not as many miles as Rabbi Stone's monthly and yearly biking, but nevertheless I am pleased. In addition, I am happy to report that I have also lost over 66 pounds! Whether or not I've kept my latest pound lost off is another story. My holiday meals and cocktails have been indulgent to say the least. Slowly I creep, inch by inch, towards meeting my weight loss goal of 75 pounds. Maybe by March? I'll keep riding and working out to help me meet this next goal. 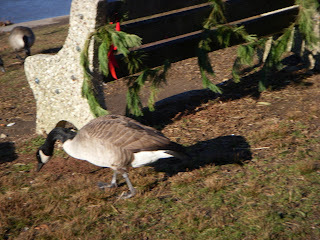 Found a Christmas Goose on my bike ride along Kelly Drive. A whole flock of these giant birds were grubbing and pecking the ground along the river near St. Joseph's Boat House halfway up the drive. Someone had decorated this bench with Christmas swag. The scene was too perfect the only thing missing was the figgy pudding and Tiny Tim. Ah! The aftermath of Christmas day. 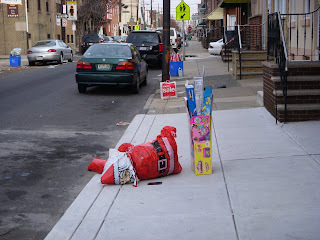 There's Santa, kicked to the curb with the trash. In England, December 26 is called Boxing Day; in the US, it's the day we throw away all of the stuff we no longer need or want, packages, boxes and broken toys. As this was a minimal Christmas for Liz and I this year, we had little if any trash to put outside. These neighbors apparently thought that Santa has overstayed his welcome. Stuffed, no longer with working parts, this poor Santa is just another reminder of the end of 2008. Time to clear out what's no longer working and a new man in to take care of the job at hand. Amen! Go get'em girl. Congrats on reaching the 1,000+ mile mark. BTW my weight has begun to creep up to so I'm back being very careful about those snacks.